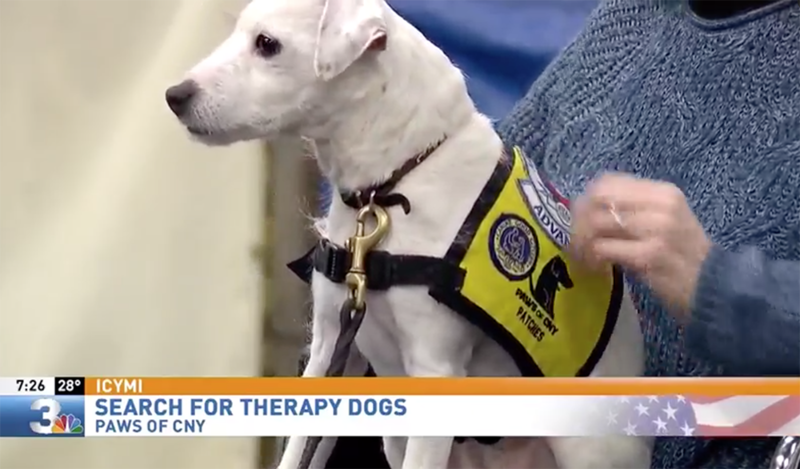 Reporters from CNY Central’s NBC3 stopped by PAWS of CNY’s recent pet therapy evaluations at The Barking Orange to better understand what it takes to become a certified PAWS of CNY therapy pet volunteer, and the ideal qualities interested members of the community should look for in their own pets. Watch the video below to learn more. 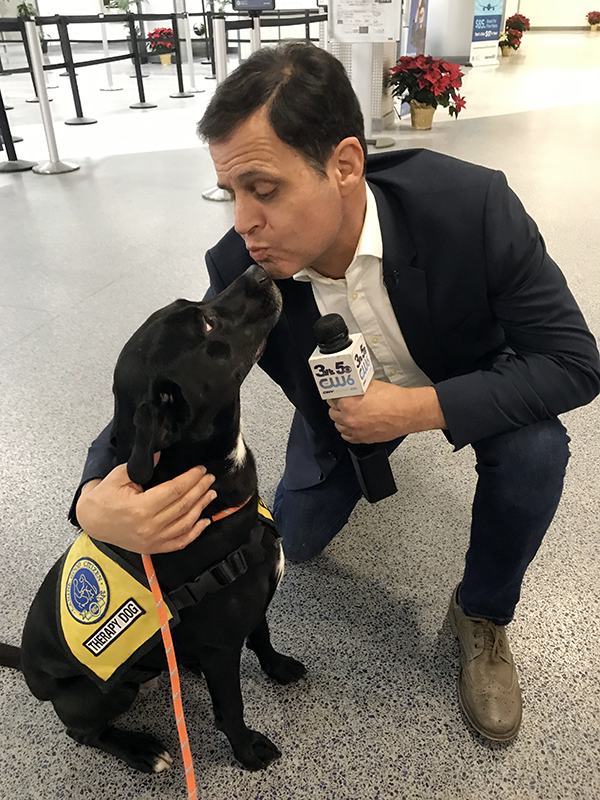 Therapy dog Poppy made time for a TV interview with CNY Central’s Brandon Roth in between visiting with airport travelers on Thursday, December 21. To help ease the stress of holiday travel, PAWS of CNY therapy dogs are on-site at Syracuse Hancock International Airport. >>Click here to read the full story from CNY Central. 1. Application – Please complete both a volunteer application and a pet application and return them along with the required health and vaccine records for your pet to PAWS of CNY. We will review your application and if you and your pet meet our initial requirements, we will contact you to begin the certification process. Click here to learn more about the application process. Initial evaluation – You and your pet must pass an initial evaluation test for our certified evaluators. If you pass the initial evaluation you must attend the next monthly New Volunteer Orientation meeting in which you and other evaluated volunteers will meet with a member of the Board of Directors to learn more about the requirements and expectations of our volunteers. Facility evaluation – At the New Volunteer Orientation meeting you will be assigned to a nursing home or assisted living facility in which you will complete the facility evaluation process over a series of three months. If you and your pet pass the facility evaluation you will have passed the complete certification process and will receive a PAWS of CNY certificate and a bandanna for your pet to wear at facility visits and events moving forward. Click here to learn more about the certification process.